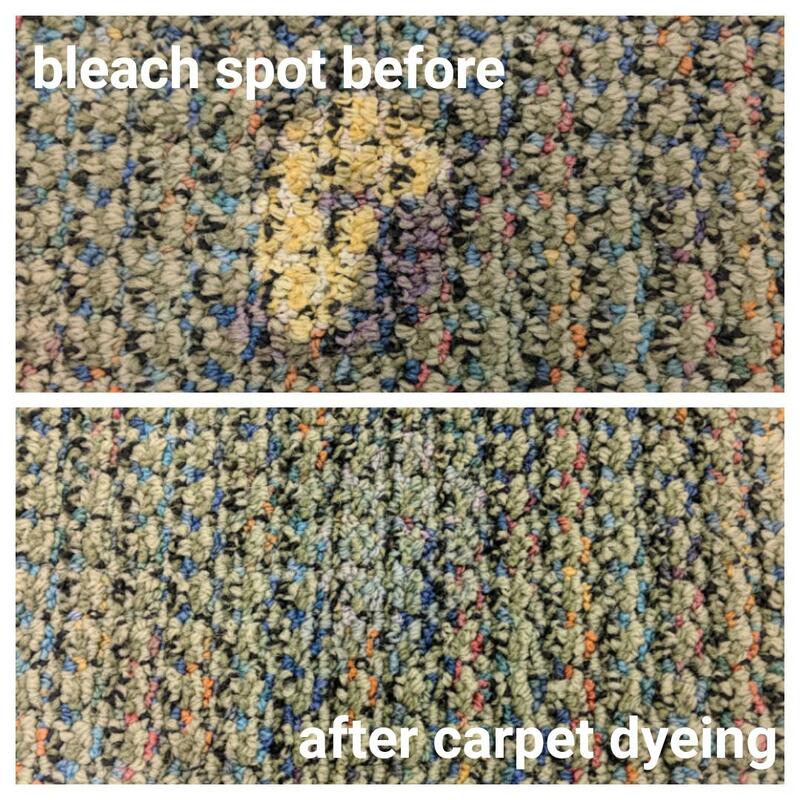 Bleach Spot Dye Repair - (310) 736-2018 Revive Carpet Repair Experts-REPAIR IT- Don't Replace it! 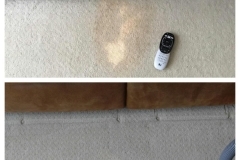 Bleach Spot Damaged Carpet Repair- Yes, We Can Dye It! Repair It- Don’t Replace It – Save up to 75% replacement costs by having us fix your carpet & rugs! No, they wont. These dyes are permanent and colorfast for the life of your carpet, we guarantee it. These are the same high quality dyes that the Carpet Manufacturers use. Yes. All of our dyes and chemicals and solutions are safe, non toxic and even odor-free. All our dyes are completely safe for both you and your family, and even your pets. MSDS (Material Safety Data Sheets) are available for your inspection upon request. 60 seconds after carpet is dyed, the carpet can be walked on with no fear of bleeding, or lessening the colorfast on it. Carpet will simply be mildly damp from water upon completion, that water will dry in a few hours. We guarantee that our dyes will be permanent and colorfast for the life of the carpet. If you’re looking at replacing your carpet, you will spend 3-4 times the amount (minimum) depending on how much dyeing needs to be done. Often, you may be renting and ight be looking at forfeiting your deposit from your landlord. We are the ones that your landlord calls when he wants to take your deposit by overbilling you for dyeing. Why not just call us for a reasonable quote now? If you have a security deposit of $2000, he will say that he needs to replace the entire carpet because of your bleach fade spots etc. More than likely the bill will be less than $500 comparatively. Perhaps even half of that. Whatever the cause or source of the bleach, there is a common thread that occurs when bleach gets spilled on your carpet. It is the ultimate sense of fear and panic that will set in when this type of accident occurs. 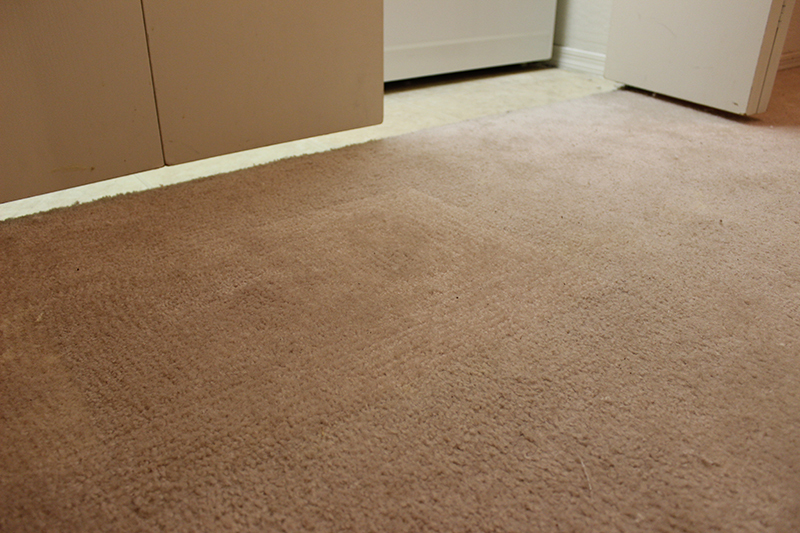 It is a very nerve-wracking thing, and the results are often unsightly and damaging spots on your carpet. These bleach stains will appear yellow, white, or orange, depending on what chemical bleached the carpeting. 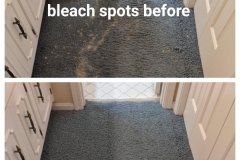 You cannot clean or treat a bleach spot like you do a typical stain that may be caused by dirt or even food, because what happens is it will actually result in the removal of color from that particular area on the carpet. 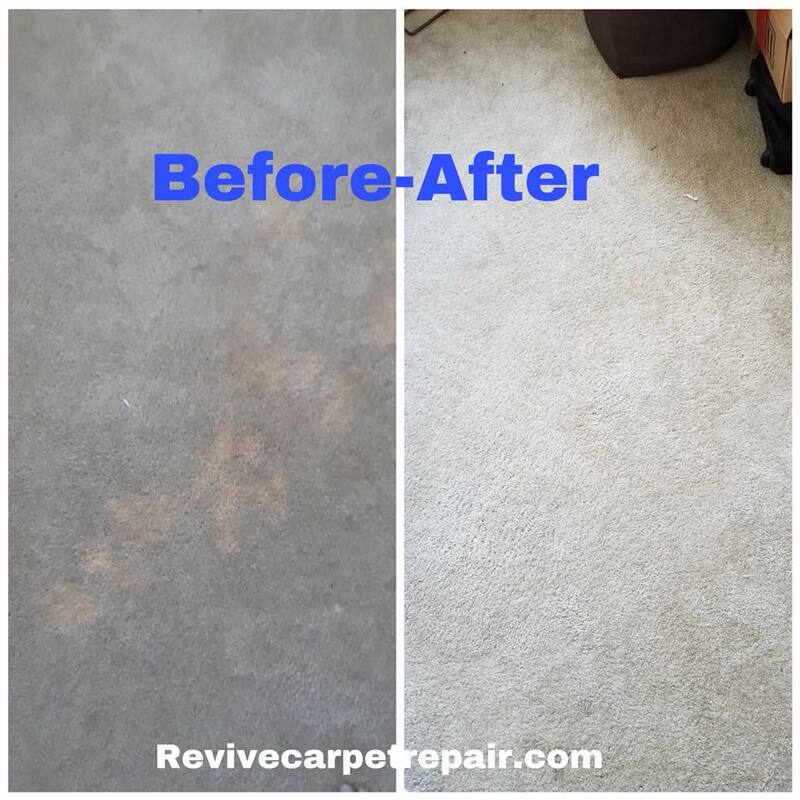 The proprietary and highly effective bleach spot repair process used by the experts of Revive Carpet Repair will leave the carpet in your home looking as good as the day it was installed, without there being any evidence to the naked eye of there ever being a bleach stain. 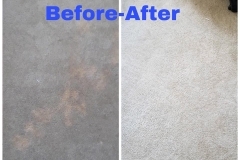 Revive Carpet Repair specializes in the treatment of permanently treating these bleach spots, so that even when your carpets are professionally cleaned, they will hold the dye color. 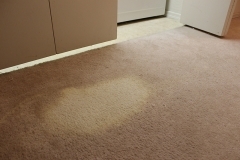 A bleach stain is a much more severe situation than a typical spot on your carpet, because of the fact that there is actually a physical change in the chemical makeup of your carpet fiber. 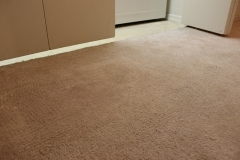 Most of the time the stains will remain even after a professional service has come in and clean your carpet. The stain may be cleaned, but the damage will still be visible. Bleach stains are not something which can simply be cleaned. 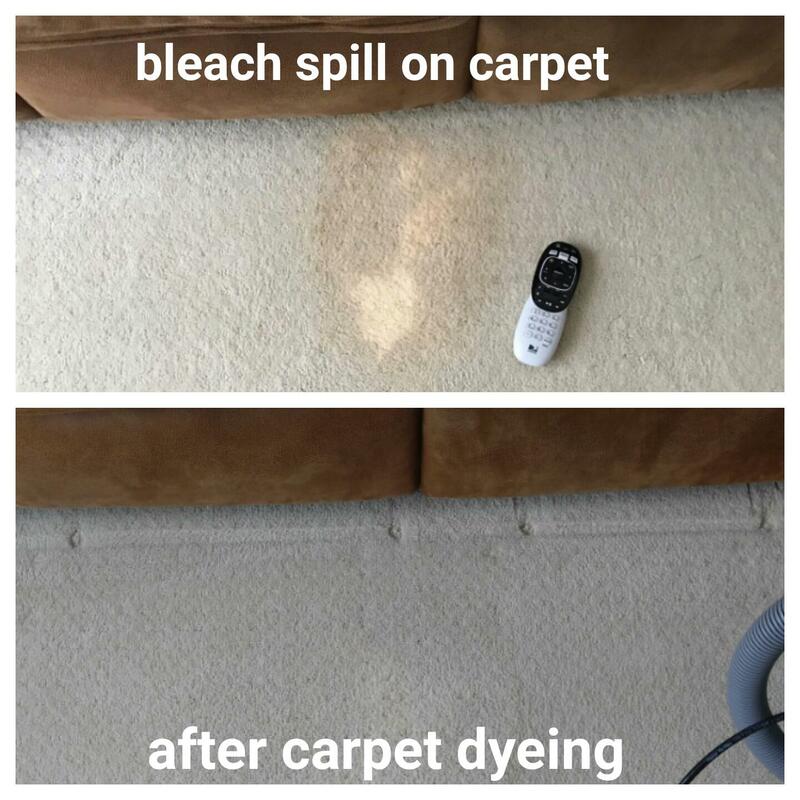 The reason for this is that a bleach spot is a permanent loss of color which is actually been caused by the color dye in your carpet being stripped out of the fibers. 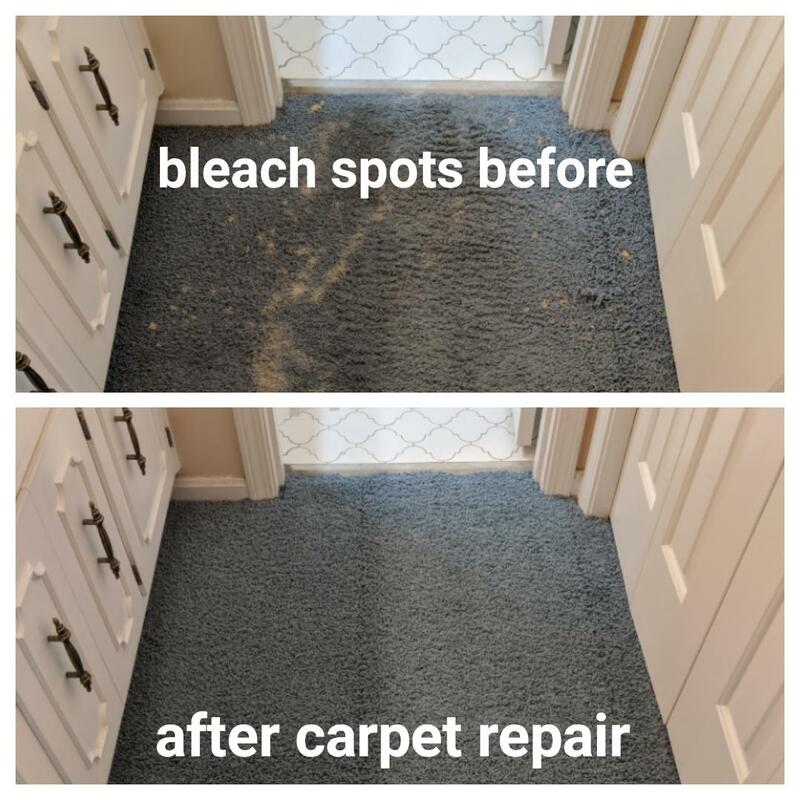 The one and only way to truly repair this type of bleach spot damage, is by the re-introduction of the color that has been stripped out, back into the fiber of the carpet. Traditionally, if your carpet was the victim of a bleach spot accident, you simply had to deal with it, place a rug or furniture over it, or patch it. Even if you try patching it, the area would most generally still stand out like a sore thumb, because that patch would come from a scrap piece of carpeting in your home, and regardless of its origin, it would not match the existing carpet. 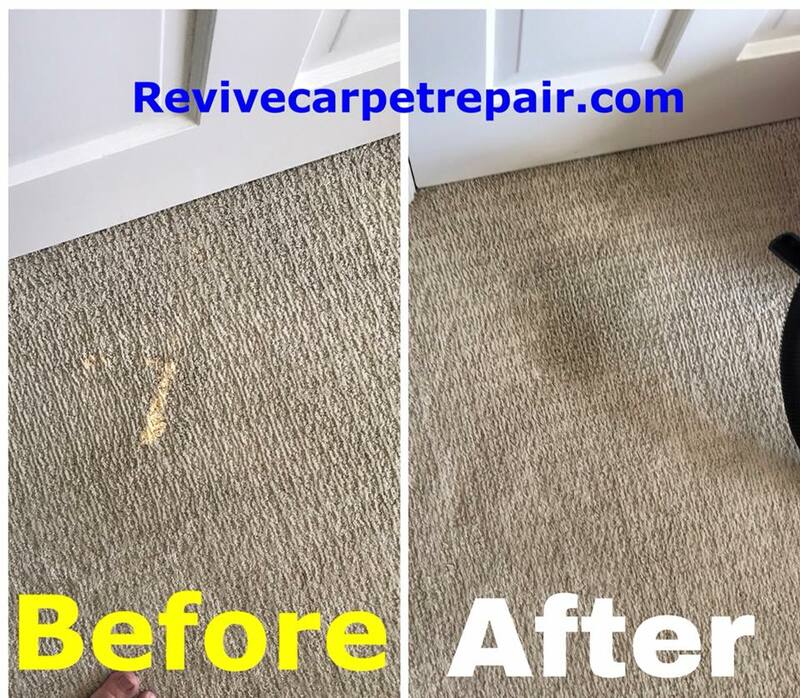 The good news is that the highly-skilled and expert team of die technicians at Revive Carpet Repair are certified and professionally trained in all areas of bleach spot and bleach stain repair, and they are able to completely restore and cover up the original damage. 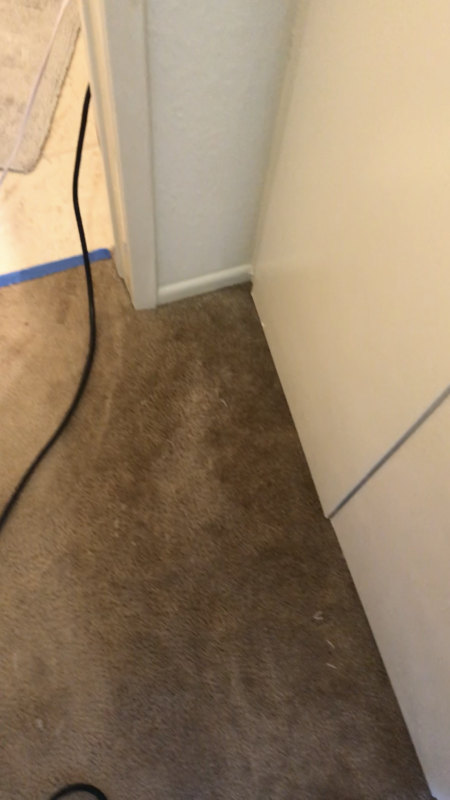 This will result in your carpet looking like it did the first day it was installed. The most important factor in the situation, that could possibly be a problem, is the completeness of what is called the bleach neutralization process. All of the bleach must be neutralized, and if it is not, the result will be re-bleaching. 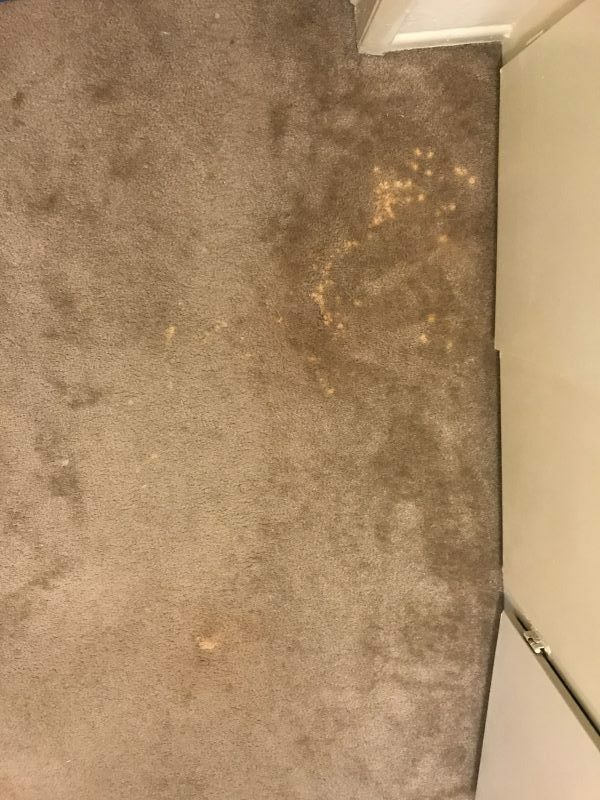 The quantity of bleach, and how recently the bleach was still down the carpet, can be a determining factor in the success of correction. Over time, chlorine bleach will dissipate. The bleach stain is easier to neutralize if it is older. Older bleach stains, that are about 1 year or older, are usually not much of a problem, and will require very little neutralization. The problem tends to come in with fresh bleach stains or large amounts of bleach. These types of bleach stains will generally require several neutralizations, before dye work can be performed. Again, how new the bleach stain is, or how much bleach stain is involved, will generally determine the cost of the repair. 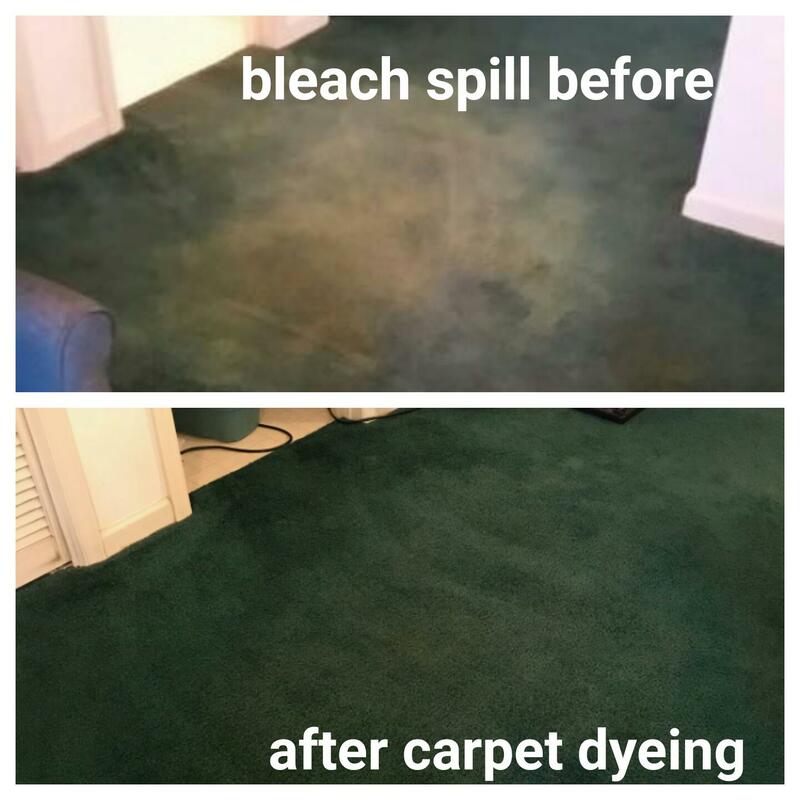 One thing that is certain, is that the typical cost for repairing a bleach spot or bleach stain will be a fraction of what it costs to completely replace the carpet. It will ultimately be the unique nature of each individual color repair job that will determine the cost. The color repairing of carpet bleach spots and bleach stains is both practical and very convenient. Before the replacing of entire rooms of carpet is undertaken, color correction is certainly an alternative which should be considered. Not only because it is usually a fraction of the cost, but also it is much less disruptive and it will most generally achieve far better results then simply performing a patch job. 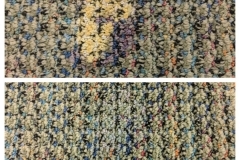 Revive Carpet Repair guarantees that the dyes we use are both color fast and permanent. We only use environmentally friendly and completely non toxic materials. And our freshly color deyed carpets are able to be walked on right away without the worry of color transference. 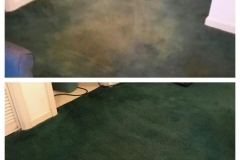 You will save not only thousands of dollars by color dying your carpet, you will also save yourself a lot of inconvenience and unnecessary headache that is usually associated with installing a new carpet. Unlike many of the here today, gone tomorrow type of companies that are out there, Revive Carpet Repair is a company that is looking to establish long-term relationships with clients based on integrity, work quality, and superior work ethic. With the thousands of homes and businesses that we have worked on in our time, we have and always will remain 100% committed to giving our customers nothing short of the most superior quality service and highly trained professionals to perform those services. We will always be able to provide complete and second to none quality in our service and repair work, and all of our services come with an unconditional 100% satisfaction guarantee.